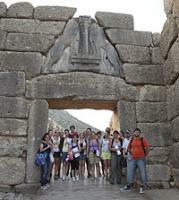 Getting to know monuments and the topography of ancient sites is one of the main objectives of the study of Archaeology. 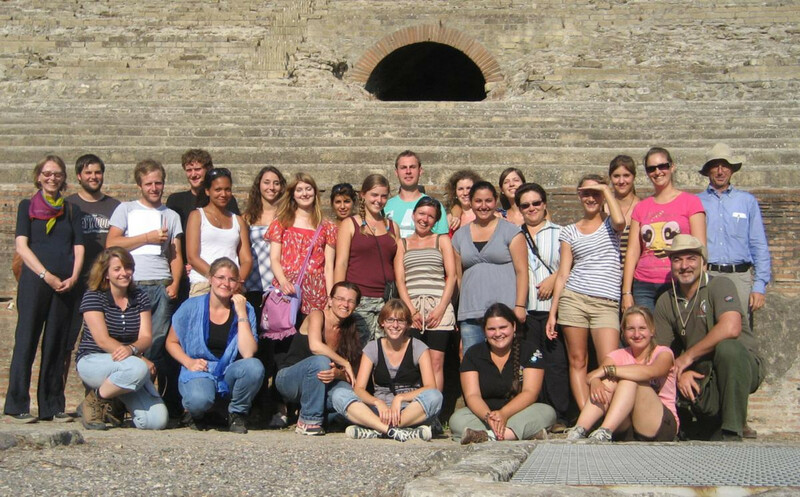 For this reason, the institute organizes excursions to places outside of Germany that used to be part of the Roman Empire. 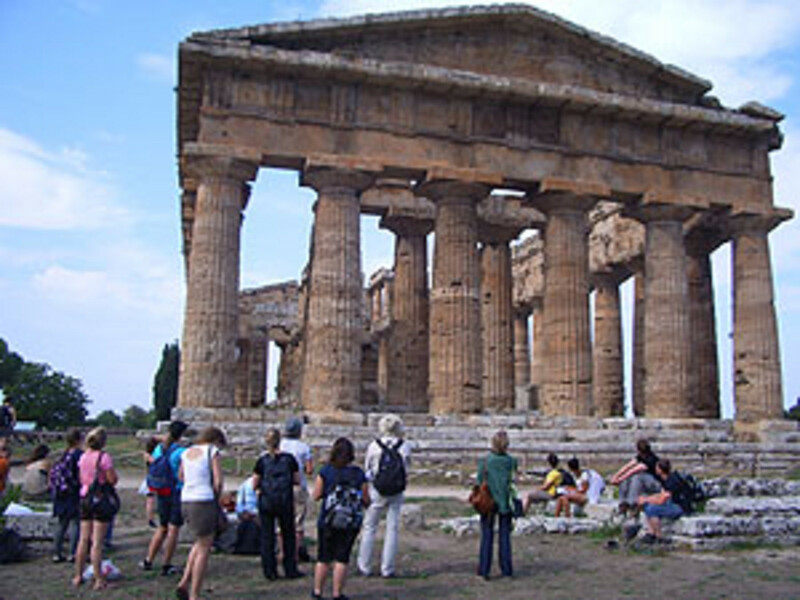 Aside from this, short excursions to excavations, museums, and recent exhibitions are often offered. 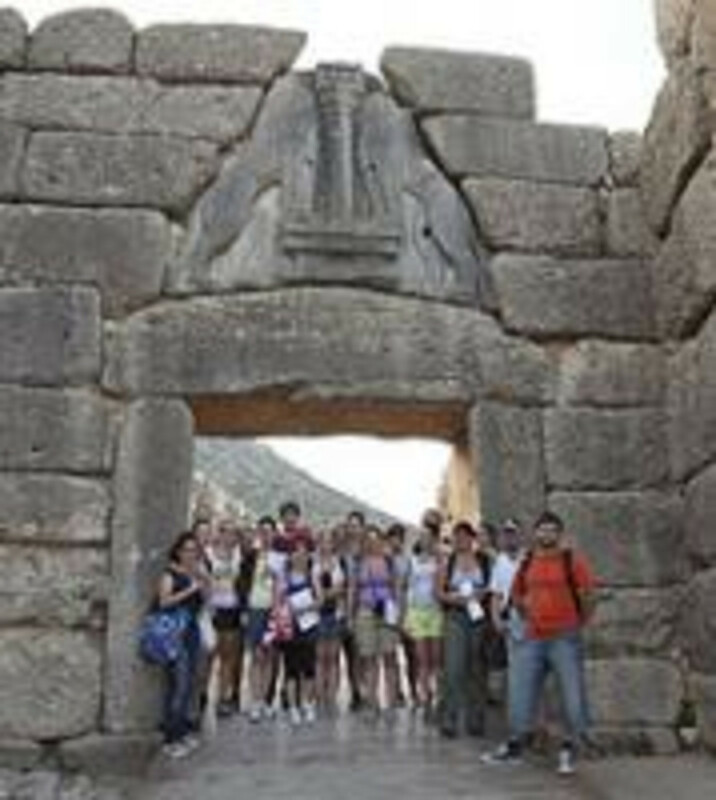 These excursions are co-funded by the university. They are considered a very intensive form of education and are closely linked with the lecturer. Multiple participations are recommended. 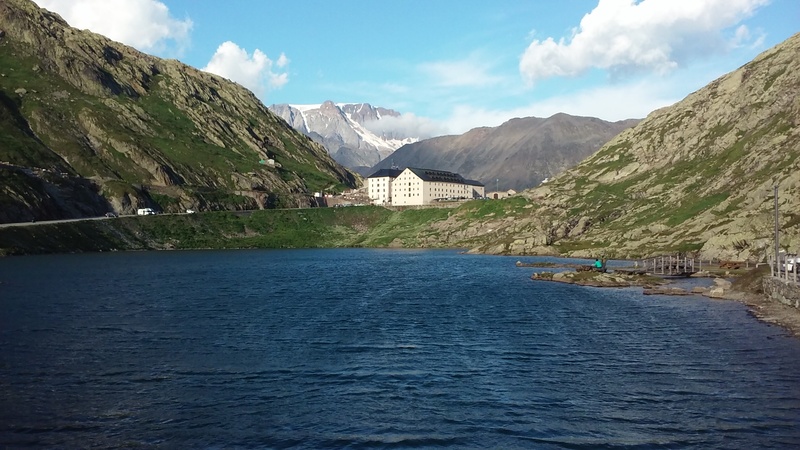 From 30.07. to the 08.08. the Institute conducted an excursion in the Western Alps. The journey led from the West Swiss across the Great St. Bernhard Pass to the Aosta valley, via the Small St. Bernhard Pass into the Savoy Alps, to Genf and the Swiss Jura back to Cologne. 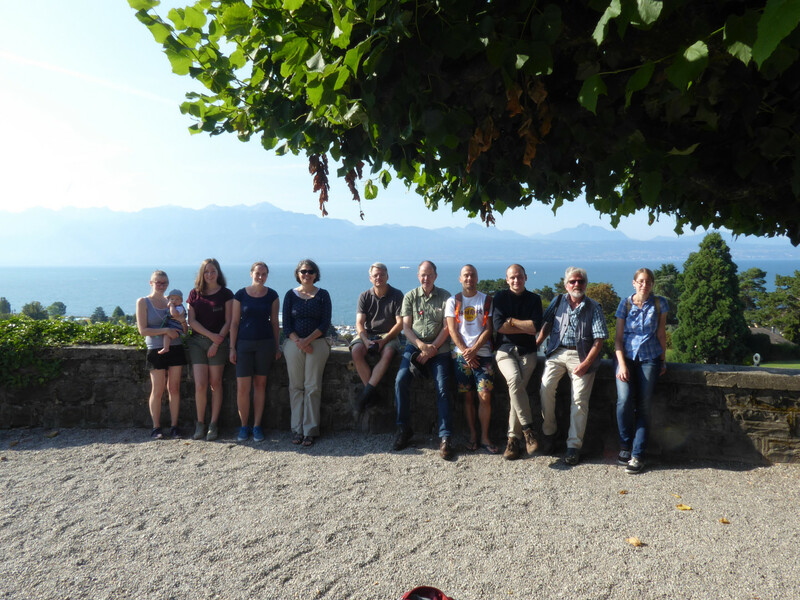 We were able to visit i. a. Roman cities (such as Avenches and Aosta), Villae (e. g. Vallon and Orbe), the mountain pass sanctuary at the Great St. Bernard and the late Antiquity Castrum on the Münsterberg in Breisach. In several museums we could study the rich archaeological material of the region, which in quality is easily able to match up to the mediterranean finds. 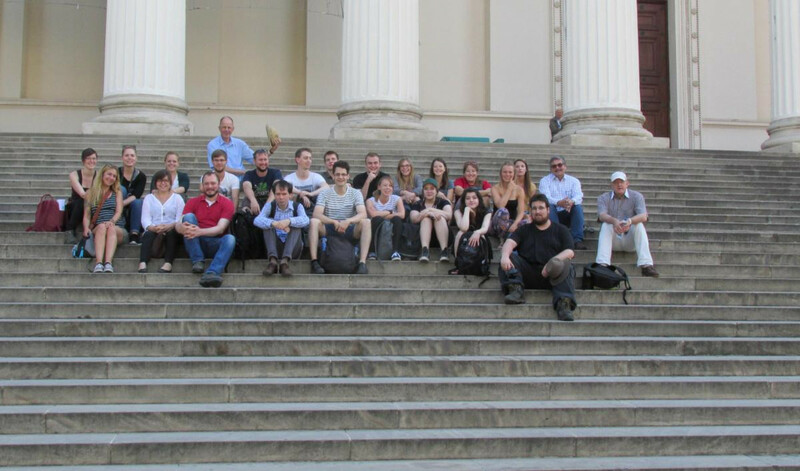 From 23.8. to the 2.9. the institute conducted an excursion starting in Budapest and ending in Vienna to visit monuments of Roman Pannonia. The visited destinations were, aside from the legionary bases and civil cities of Aquincum (Budapest), Brigetio (Komarom), Carnuntum and Vindobona (Vienna), several military institutions of the Roman Danube border. In the numerous museums, several remains of the rich ancient cultures of the Danubian provinces (sarkophagi, sculpted tomb stones, wall paintings, gold jewelry of the migration period) could be studied and analyzed in detail. 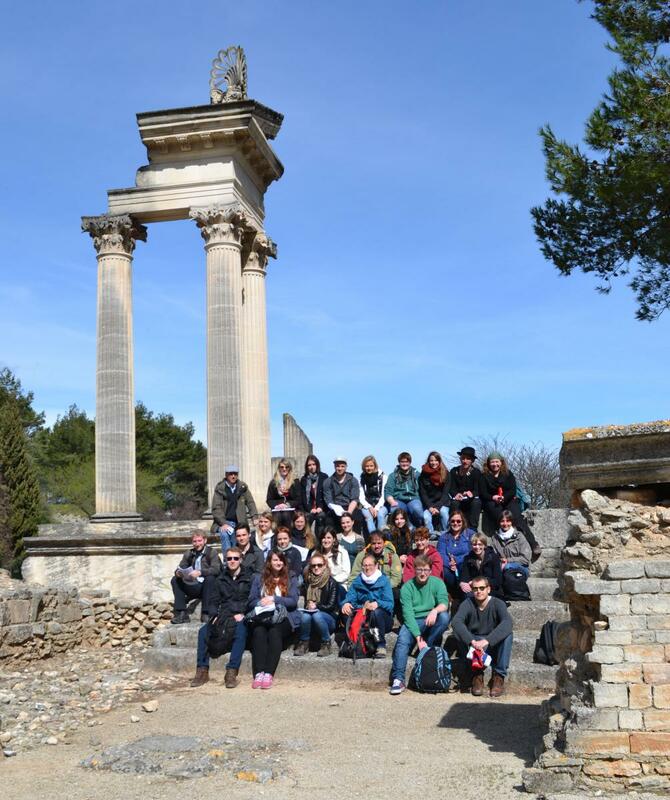 The institute organized a round trip through the Provence and therefore the Roman province of Gallia Narbonensis from March 23rd to April 2nd 2015. The route was planned starting in Lyon, to Vienne, Vaison-la-Romaine, Orange, Avignon, Nimes, Arles, Marseille and ending in Aix-en-Provence. On the way, Roman theaters, amphitheaters, aqueducts, such as the Pont-du-Gard, temples, oppida and museums – and many others things – were visited. Lecturers: Prof. Dr. Dagmar Grassinger, Prof. Dr. Michael Heinzelmann and Julia Schulz M.A. 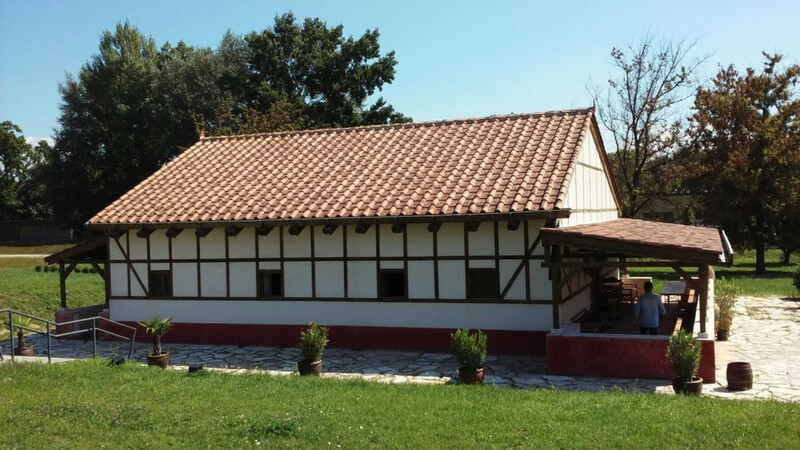 The excursion of the Archaeology of the Roman Provinces in 2011 lead to Dalmatia. With a ship, the coastal cities of Zadra, Nin, Sibenik, Trogir, Salona-Solin and Split were visited from the 30.9. to the 9.10. Besides impressive monuments such as the Palace of Diocletain in Split or the Forum of Zadar, several museums have been visited. The new museum of glass in Zadar and the national museum of Split were especially imposing. 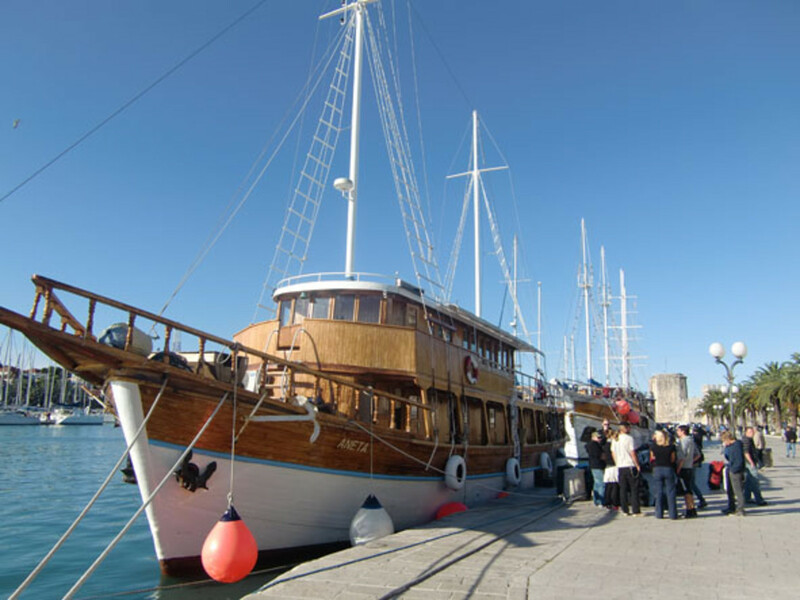 Trips to the legionary camp of Burunum (hinterland of Sibenik) and to the island of Vis were undertaken by bus and ship as well. For the nice guided tour, we would like to thank Hr. Miletic (Burnum) and Luka Bekic (International Center for Underwater Archaeology, Zadar). Lecturers: Thomas Fischer, Salvatore Ortisi. Participants: Berger Lisa Christin, Cantarella Placido, Düpmeier Thomas, Franzkowiak Stefan, Gansera Daniel, Greven Jessica, Hillmann Susanne, Karger Oliver, Kieper Martin, Koopmann Achim, Koppmann Claudia, Kreuzburg Lea, Krieger Elisabeth, Küpper Alwy Chloe, Lindner Christoph, Matesic Suzanna, Neuhaus Steffen, Palombo Florencia, Philippen Nicholas, Rucinski Eva, Schmid Franziska, Schmidt Heiko, Schmidt-Wenghoffer Kristian, Schöne Christian Adolf, Skela Denis, Sperling Heinz, Tews Daniel, Welle Patrick. The institute conducted an excursion to the gulf of Naples from 26.9. to 7.10.2011. 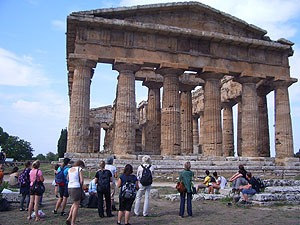 Beside the extensive study of Pompeii, Paestum, Herculaneum, Oplontis and Stabiae have been visited. The last days were spent in Naples with a visit to the underground excavations of the city, the museum and trips to Pozzuoli and Baiae. We would like to give a special thanks to V. Kockel (Augsburg), C. Brasse (Cottbus), M. Staub Gierow (Stockholm) and P. Kastenmaier (Pompeii) for the guided tours. 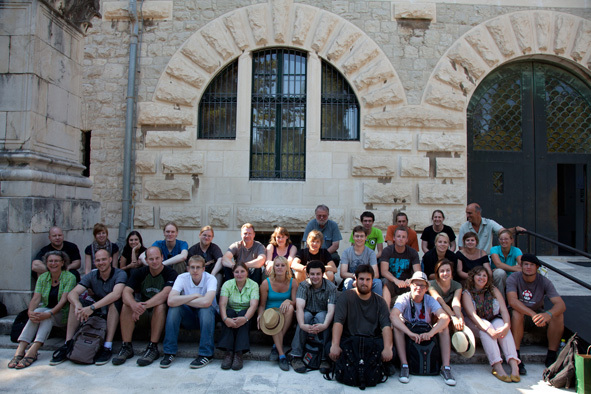 Participants: Funda Askin, Angelika Brauers, Philipp Hagdorn, Lorena Hagemann, Maria Heitkamp, Ella Hetzel, Gesine Jaeger, Ann-Kristin Jäger, Chris Jülke, Lisa Jureczko, Andreas Kipke, Verena Kluge, Demian Lienhard, Shabnam Moshfegh Nia, Corinna Müller, Ann-Kathrin Rastetter, Irena Schultz, Annemarie Stenzel, Josephin Szczepanksi, Julia Wahlsdorf, Franziska Weber, Diana Wozniok, Cornelia Zeiske. 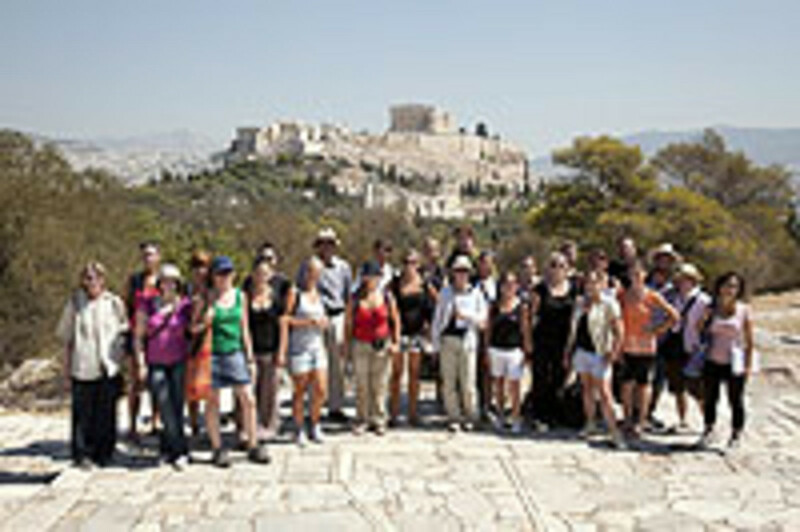 From 1st to 12.9.2010 the institute conducted a trip through Greece. Starting with the Athens Acropolis and Eleusis, the most important excavations and museum on the Peloponnes (Isthmia, Corinth, Mycene, Argos, Epidauros, Messene, Olympia) and Delphi have been visited. The last days were spent in Athens and Attica (Brauron, Oropos, Thorikos, Rhamnous, Sounion). We would like to give a special thanks to G. Sanders and K. Slane (Corinth), J. Maran (Tiryns), A. Hennemeyer (Olympia), J. Stroszek (Kerameikos). Participants: Dagmar Albus, Manuela Broisch, Katharina Büngel, Serena Caporossi, Irina Dudar, Hannah Geusen, Dan-Marvin Gluba, Verena Göbel, Philipp Hagdorn, Maria Heitkamp, Chris Jülke, Sarah Kalina, Verena Kluge, Lisa Kröger, Cathalin Recko, Mareike Röhl, Heinz Sperling, Annemarie Stenzel, Ruth Stiefelhagen, Josephin Szczepanski, Hülya Vidin, Alexa Wilder, Yasmin Zschiedrich. 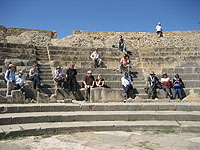 From 26.9. to 9.10. an excursion to Tunisia was conducted. 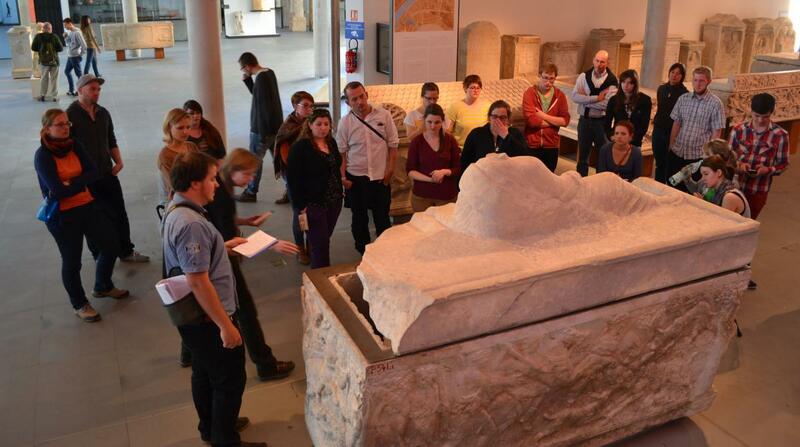 In a roundtrip Carthage, Uthina, Kerkouane, Sbeitla, Haidra, Dougga, Chemtou, Thuburbo, Maius and Uthica were visited. Participants: Viktoria Bauer, Melanie Dederichs, Michael Drechsler, Eleonora Gankova, Daniel Gansera,Antonia Glauben, Margot Haas, Mathias Heine, Martina Hundt, Chris Jülke, Theresa Jürgens, Barbara Köstner, Claudia Koppmann, Louise Rokohl, Hubert Murmann, Julius Peters, Marcel Riedel, Paul Scheding, Heinz Sperling, Renate und Ernst Thomas.